As usual for September, most of these are either gifts or purchased with gift money. 1) Beaded Purse - Perhaps you can't tell in a picture how pretty this bag is. It has a metal clasp colored in gold, with a delicately gaudy pattern of vines on it. The material is made of soft grey stitches woven with blue-grey beads that catch the light and sparkle most brilliantly. It's perfect for an evening out, except that the space inside is so small that I can barely fit my cell phone and a lip color in it. 2) Pewter Dinosaurs - On the way back from the Painted Desert earlier this month, we stopped at a store with lots and lots of fossils and gemstones and rocks and such. It was all very exciting, but I don't have the space to buy more at the moment, so I just picked up a handful of tiny dinosaurs. They've been hanging out with my books--at Heathcliff's feet, in fact. 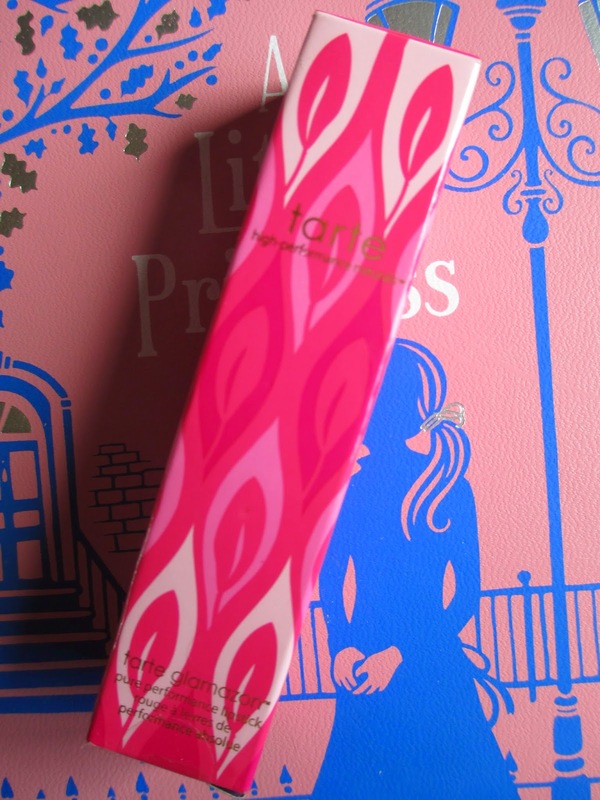 3) Tarte Glamazon Pure Performance Lipstick in Foxy - While I love Tarte's lip tints and shimmers (the ones that are like crayons), I've never had one of their lipsticks. This bright pink is much fuller in color than the tints, making it necessary to bring out my lip liner/primer, but it still feels softer than a regular lipstick. I think I'll like using it when the weather cools down and I want that extra bit of color to combat the cold. 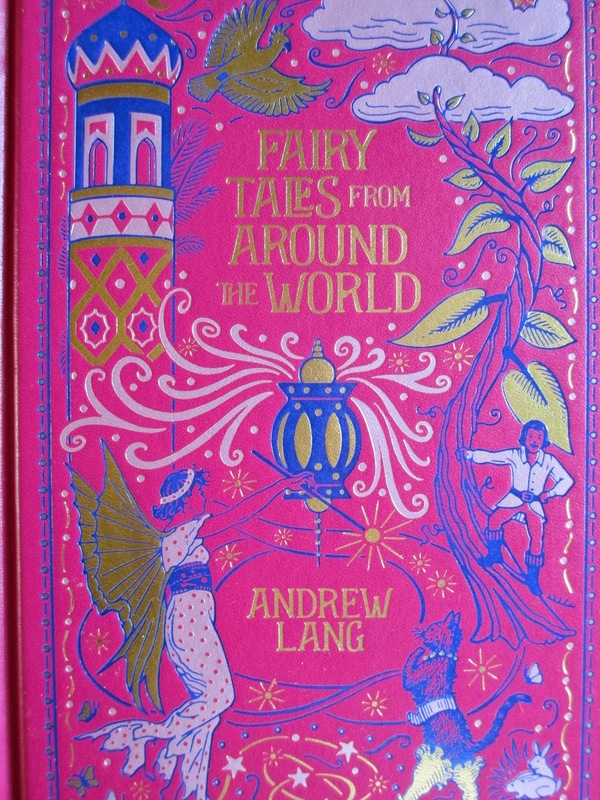 4) Fairy Tales from Around the World - I know I already have two of the Barnes and Noble leatherbounds with fairy tales, but this copy was so pretty with its bright color and layers of pictures that I had to get it. (I also got a few more books while I was there.) It has stories from the Blue Fairy Book, the Red Fairy Book, etc. There are also a good amount of pictures. 5) Tarte Beauty & the Box Amazonian Clay Eye Shadow Quad in Just Deserts - This is my third of these shadow palettes; I do love them. While my other brown set has warmer shades, these are more stark. The darkest is a very dark brown, and the top two shades are very, very light. So I feel like this set is good if you want to do an almost black lid, but in a neutral way. 6) Notecards Set - While I was at Barnes & Noble, I wandered into the paper section and found this little set from Kartos. It's beautiful paper that folds open to reveal two pockets, which hold small notecards and envelopes with the same delicate design. I thought they might be nice to have in case I ever want to send someone a short note. And they look beautiful in my little Victorian writing desk (the lap one). 7) Shiny Gemstone Necklace - What I find pretty about this necklace is the subtlety of colorfulness. Shades of pink, blue, and ivory are set against gold to create something soft yet playful. 8) Green Mademoiselle Notebook from Niquead - I know, I have prettier notebooks than this one. But I had been eyeing it at Papyrus for a while because of the green dress, so I thought, why not? It has gold-edged pages. 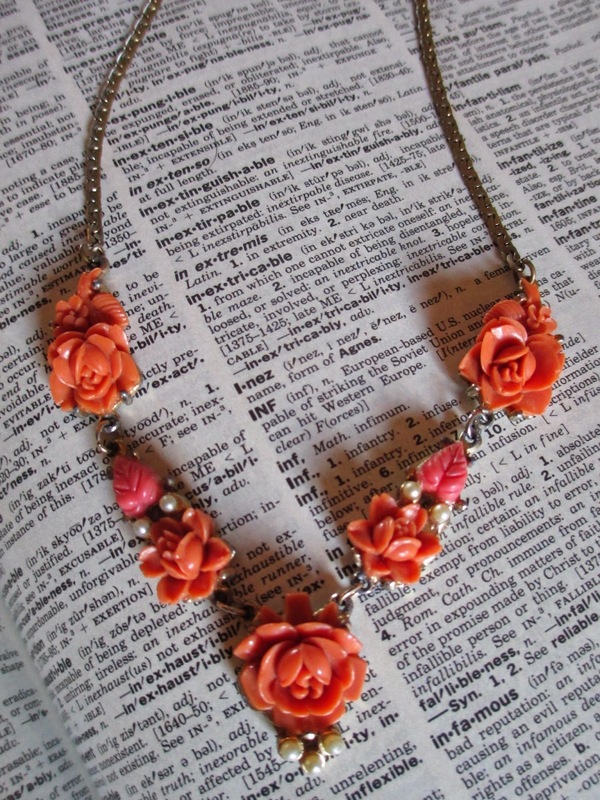 8) Flower Necklace - At the same antique store booth where I found my watch necklace this summer, I came across these orange flowers. Again, this is my idea of fashion jewelry--not what the clothing stores sell. 9) Green Pants - I had been wanting some military green pants for a while, but couldn't find any that fit right. These are from Gianni Bini and they're in olive green and I think they were designed to fit above the ankle, which of course means that they fit short me just right as regular length pants. 10) Cameo Necklace & Bracelet Set - There I was at the aforementioned antique store. I turned a corner and there it was, gleaming in a display case. I paused and smiled at it, admiring its beauty. Then I tilted my head to see the price tag. No, I thought, that must just be the price of the bracelet. But lo, and behold, that was the price for both the necklace and bracelet. Deciding I wouldn't find another set like this soon, much less at this price, I brought them home. I do love cameos, and the metal (it's possible it's silver, but I really don't know how to tell on something like this) setting is filled with filigree and flourishes and of all the colors in the world, the little (faux) stones are green. Wasn't it made for me? I'm having a hard time researching these necklaces. The tag said it was Victorian. Some of the ones online say they're from the 1880's. I think somewhere said something about the 1930's. Either way, it's a beautiful set. I had come to a certain way of thinking. Although I do think that Once Upon a Time's good moments make it worth sitting through the mediocre moments, I was beginning to think that the season openers and finales weren't the strongest episodes out of each season. So even though I was excited for Season 4 to start last night, I wasn't necessarily expecting much from "A Tale of Two Sisters." For all my worry, this episode was well put together and bodes well for the rest of the season--even for the possibility of moving on past Season 4 into even more seasons. Let's talk about Frozen first. It does seem likely that this show was, well, ordered to include certain details from the movie (maybe not, but it does seem that way, doesn't it?). Sure, the fairy tales they do that already have Disney versions tend to echo those Disney movies--but not as much as the Frozen story line has already done in just one episode. Elsa, Anna, and Kristoff all look and dress exactly as they do in the movie; at least, there is significantly less variation than there has been for other stories. The short scene with the trolls almost seems like it's just added in so that the audience can see the trolls. You know what may have been my favorite thing, though? That wedding dress. That design, that fabric--that's a lovely dress. Of course, it isn't as if the show is providing an exact retelling of the movie. It seems that we are coming into the story after the plot of the movie, so while much of those events may still hold true, where we go from there is different. And it would seem that I was right to wonder where Elsa's world was--it's in the same world as Snow White's, just a short ship's voyage away. That's where we make the connection to the current set of characters. While I wondered if the connection would come through Robin Hood and Marian or Regina, I completely overlooked Rumplestiltskin. How could I do that when last season's finale showed that Elsa was trapped in the lower level of his castle? What if he killed Anna? I would make that my theory--except that then Anna wouldn't be a present-day character, and that seems unlikely. But where is Anna, and how did Elsa end up trapped? And does Elsa know where she is when she finds herself in Storybrooke? Maybe I liked this episode because the Charmings were in it so little. Maybe I liked the hinting at a new role for Emma. Maybe I was fascinated by Regina's new quest to find the author of Henry's fairy tale book. Maybe it was just nice to see Regina acting evil again. She's so happy when she's evil that I found myself so happy to see her embracing her evil smile and purple lipstick again, turning herself into smoke at every turn. Or maybe it had just been a while since I'd watched Robert Carlyle. Interesting that his little act of deception at the end of last season appears to be coming to a close and he does genuinely seem to want to start over. And wasn't it so nice getting the Beauty and the Beast dance? But what is that box, and what does he intend to do with it? Questions, questions; I have so many. The questions are one of the best parts about this show, and we're off to a good guessing game this year. Ah, sometimes life is very annoying. I just typed out this entire post, only to accidentally delete it all with no way of getting it back. So this time I will put it together differently--how about a list? Perhaps that will be more coherent, anyway. Season 4 of Once Upon a Time is already starting up again on Sunday. Because it's a show with so many characters and stories, I'm quite curious to see what they do with it this time. I don't like to see spoilers, so I haven't been looking at cast lists, promo images, or interviews yet. But I do know that Will Scarlet (from Once Upon a Time in Wonderland) is going to be in this season and they will be doing a version of Frozen. 1) How will Frozen fit in with the current plot and characters? Perhaps one of the characters we already know will turn out to be Elsa's sister, or maybe one of them acted against Elsa in the past. 2) Will Elsa's world be part of Snow White's, or does she come from a different world? Given the inclusion of Neverland and Oz last season, it's possible that she comes from a different world, although that might make connections with the current set of characters more difficult. 3) Will there be crossover between the Robin Hood and Frozen plots? I come to this question, naturally, because it seems like these are two stories we're going to be exploring more of this season. They might still be separate, but it's always easier to build connections between new stories than existing ones. In last season's finale, I wondered if Robin Hood's wife might double as Anna's character--but I suppose I was wrong. 4) What does Emma have to do with any of this? Emma's first quest was getting to know her son and lifting the curse on Storybrooke; since then, she's gotten to know the rest of her family, saved Henry again, and reunited (temporarily) with Henry's father. She's the character designed to bridge the gap between the audience and the fairy tales. So what does she do now? And will the characters ever leave Storybrooke? 5) Will Bae come back? I've already explained why I want him to (you can read that post here). It seems odd to have Rumplestiltskin without his guilt and regret about his son. He can have guilt over his son's death, yes, but it's guilt without action unless the show lets Bae come back. I don't know. We'll see how it all unfolds. I can't wait until Sunday night. I never know who has or who hasn't had a Milka bar before. Sometimes they're pretty readily available these days, either from World Market or another store selling international products--but not everyone goes to stores like that. So if you have not had a Milka bar before, I would recommend them as a good, creamy, sweet millk chocolate. World Market also has some pretty, cow-shaped Milka cookies right now. And if you have to heard of the brand before, Milka was originally made by Suchard in Switzerland; that company has been subject to different mergers and such and is now under Mondelez International. The bar I'm looking at today, however, is not the plain Milka bar. It is the hazelnut milk chocolate. If you know me, you'll know that I like hazelnut and chocolate, as I think most people these days do, given how popular Nutella is. (My opinion: buy almost any other chocolate hazelnut spread besides Nutella and it will be better quality and less plasticy, with more chocolate.) The hazelnuts in this chocolate are in the form of hazelnut paste, so there is nothing crunchy to mar the effect of smoothness. The smoothness is, after all, what makes chocolate and hazelnuts so nice together. The sweetness is also a factor, which is why the combination is more irresistible with a sweet milk chocolate. And sweet milk chocolate is what Milka does best. The chocolate is so sweet and milky that my 80 degree house is much too warm for it. It sticks to the packaging and doesn't feel completely solid. But that's okay: soft chocolate is just a step away from chocolate spread. It's chocolate spread without the need for a spoon. This chocolate becomes instantly a melty mass in my mouth, tasting of chocolate and caramel and vanilla and hazelnut. Very milky, very nutty, and very sweet. It is nothing fancy and nothing gourmet, but it is everything irresistible and everything delightful. It's the kind of chocolate I buy when I'm celebrating quietly to myself, letting myself simply indulge. I know, I'm odd: even though I wasn't sure what I thought of Dame Darcy's illustrations, I still bought her illustrated edition of Jane Eyre. Maybe it was because of the awesome, leather-look-alike book spine or maybe because her biography paragraph calls her a "self-proclaimed Neo-Victorian." But now that I've had a chance to pore over these pictures a couple more times, they've really grown on me. I'm still not completely sure how to describe her style. You can get a small taste of it from the picture on the cover. It has a slight graphic novel informality to it, being composed much of lines and sharp angles. There's also something Gothic to it in the tone and texture of darkness paired with pretty Victorian things; this is, of course, fitting for the style and era of Jane Eyre. While most of the illustrations are in black and white, some of them are colored and printed on glossy pages. These are all full-page. But there are also some small images that sit around the text, making it all more immersive. The small pictures of Mrs. Rochester, those were perfect. Oh, and the eye on page 83. You know what I like about these illustrations? They're dark and conflicted and passionate and even slightly other-worldly. And that's what I like about Jane Eyre; it isn't frilly or constrained, and it's best moments are all about powerful outbursts of emotion that take on a life of their own. I think Dame Darcy found a way to simultaneously emphasize the tone of the book, show the historical side of the story, and bring a modern edge to it all. I flipped through the book page by page to look at all of the pictures in order, and it was like reliving the whole book; that means these illustrations are successful companions to the story. Goodness, how many years has it been since I first read The Silmarillion? Seven? Maybe even eight or nine? I used to judge people based on this book. If they said they liked The Lord of the Rings but hadn't read The Silmarillion, then they weren't really into Tolkien. Of course, since then I've learned that for many people, The Silmarillion is just the beginning of Tolkien lore. Last year, someone got the illustrated edition for me. This is the book that I used to pore over at Barnes & Noble, staring into Ted Nasmith's paintings in awe and wonderment. So to finally own this book and its gorgeous illustrations was quite a big deal. Eventually I decided to read through the book again using this copy. First the plan was just to read a chapter every so often when I felt like it. But then, a couple chapters in, something happened that I hadn't expected. You see, I was still fairly young when I read The Silmarillion the first time around. That was years before I read Heart of Darkness or Paradise Lost or Moll Flanders or As I Lay Dying. While I loved the language of The Lord of the Rings back then, The Silmarillion was still a challenge. This book is the mythology of Middle-earth, told more like a history than a novel. Each chapter could be its own novel, if it were told in full detail. So there are so many names, so many places, so many characters, and so very many descriptions of geography to keep track of--all with only so much of the usual excitement and such that a novel would bring. It was a hard book to get through, and I was expecting it to be that way again. But this time it was easier for two reasons. One, the names and events were already familiar to me. It was easier to distinguish Yavanna from Varda or to kind of keep straight Finrod, Fingolfin, Fingon, and all the other names beginning in "F." I could easier follow one plot line because I knew already how it connected to what was coming next. The other reason that it was easier was that I have grown as a reader. I've probably read hundreds more books since the first time I read this one. I've read things that were hard to understand or slow to get through--things that, for all my effort, I didn't even end up liking, anyway. But The Silmarillion does not fit into this group. This time, I really enjoyed this book. For all that it is told like a history, the language remains beautiful. It's stunning, like the best passages of the King James Bible mixed with an epic romance (and by romance I don't necessarily mean love story). The language is sweeping and bold, so magnificent in the way that it speaks of other worlds and yet so very approachable in its expressions of joy and sorrow. And the characters, oh, I like them a thousand times more than the Greek gods and goddesses. 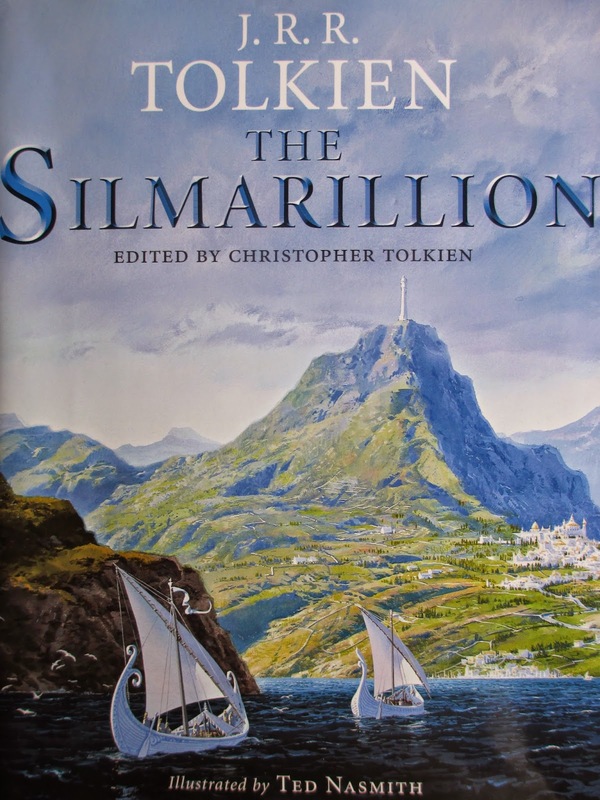 Tolkien's awesome, and Ted Nasmiths' illustrations for The Silmarillion are equally awesome. I'm kind of upset with myself that I didn't check the best by dates on the two David Bacco chocolate bars I bought in San Diego. The Madagascar (click here for that review) had a date in December and this one is marked for Halloween. That is, a month and a half away. (Okay, that was an additional month or so ago that I bought the chocolate, but still.) I really wish I could have tasted this chocolate in its prime instead of here towards the end of its life. Last time I said I was waiting until I got to the second bar to read more about the company. As it turns out, their website has very little information. It's more David Bacco's resume than information about the company and the chocolate. He has quite a background in the culinary world, working with desserts, pastries, candies, and chocolates. 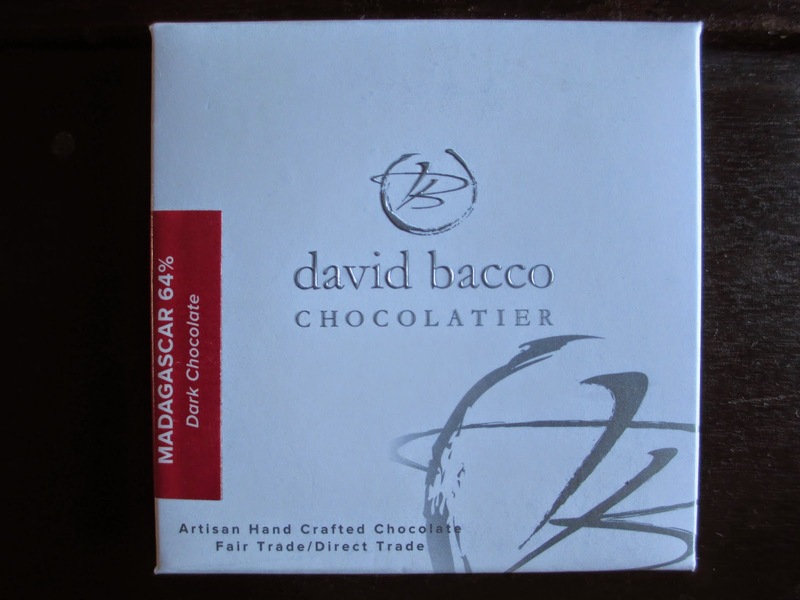 But I'm left wondering why he had David Bacco Chocolats from 2008 to 2010 before beginning David Bacco Chocolatier later that year; maybe those were the different names for the shops, but the company is essentially still the same? His background working with desserts explains why I liked the chocolate bar design: desserts are very much about presentation and beauty. But when I am set with a high-end chocolate bar, I want to know about how it is made and how it comes together. Sure, these bars say they're Fair Trade and the cacao origin is provided, but at least on the website I want to hear more about the plantations where the cacao is grown and the factories where the chocolate is conched and refined and molded. But let us return to the chocolate and its taste, apart from what I do or don't know about the company. Once again, there is some light, ignorable bloom, which remains on only half of the bar. The other half was somewhat stuck to the clear wrapper, which must have removed the bloom. I find myself strangely fascinated by the combination of light and dark, the pale white against the rich brown, all set in these wonderful triangular shapes. This second bar of mind is the Guanaja 80%, which comes with this label: "Cherry-floral-cacao aromas lead to deep, rich cocoa, tobacco and leather notes, release bitter cocoa, and black coffee-molasses notes, with a hint of red fruits ending on a bitter and tannic finish." I know these kinds of labels are called flavor notes, but aren't those a little too many commas and a little too many clauses falling on clauses? I'm getting distracted again. At 80% cacao, this is the type of chocolate that some people will find too dark and that I usually have to have two pieces of before I can begin to taste it properly. It tastes bitter at first, but once your mouth is used to it, it tastes rich and even gentle. Like the Madagascar bar, the Guanaja also melts at a nice and slow pace, very smoothly without any graininess. But I'm not sensing as great a depth of flavor notes as the label suggests. The type of flavors given make sense: it is deep and rich and red. But usually when a chocolate gets into this high of a cocoa percentage, the reward is a complex layering of flavor (unless it is a badly made chocolate where all you taste is bitterness). And I'm just not sure that I'm getting that here. It's the same story as with the Madagascar. This is a good chocolate. I'm enjoying it. It delivers quite a pure, in depth experience of cocoa flavor. I would much rather have a couple of triangles of this chocolate than many a flourless chocolate cake I've had. And I would much rather have a bar of this chocolate than many another bar of chocolate I've had. While I think I wanted to enjoy these David Bacco bars more, they're not bad and this one certainly is better suited to my tastes. It's rich in chocolate without falling into either intense sweetness or bitterness. Click to read my thoughts on the books: If I Stay and its sequel Where She Went. There is a reason that I have not done any sort of write-up about If I Stay the movie, despite in what high favor I hold the book on which the movie was based. And, no, the reason is not that I was disappointed by the movie. The reason is simply that, even as a movie, this story remains immensely personal. Looking back at my first post on the book back in 2010, I see that I compared it to reading a memoir because of how important Mia becomes to the reader. And I think this is Gayle Forman's power as a write: she can portray human emotion and human relationships with full, beautiful, and tragic power. But how do you take a text like that and put it on a screen? Isn't a screen something public and far away? If I Stay was not a big release in theatres and the movie had a tiny budget. I do wish it had had more of a budget so that it could have had prettier cinematography or a more unifying score, things like that. But on the other hand, a small movie has power of its own. If the whole world isn't watching with you, you have the chance to be alone with the story and to let your reaction be your reaction only--like reading a book in silence. So let me focus on what worked well in this movie. While I think there was more focus on Mia's relationship with Adam, there was still that family dynamic within the movie that I think is so scarcely portrayed well in either movies or TV. That in itself in entirely refreshing and endearing to see. And as far as Mia and Adam go, you know what I like best about their relationship? They have music in common because it is something so important to them both but they each focus on entirely opposite kinds of music. The inclusion of both Adam's rock band and Mia's cello music brought in exactly the right atmosphere because this is the music of the characters. I only wish there had been more of this music and less of the generic pop songs that were also part of the soundtrack. After seeing the movie, I went on iTunes and bought most of the Willamette Stone (Adam's band) songs from the soundtrack. These are so well put together. The quality is designed to reflect where the band is at each point in time and the lyrics and sound go along with the plot and emotions of each moment, as well. Each song come to be so touching, in different and developing ways. First it is the story of young love and bright hopes for the future. Then it is struck by tragedy and seeks a new kind of joy, one that has surpassed all the physical pain of the world. You know what I'm going to do? Since I bought two David Bacco chocolate bars, I'm going to wait until I get to the second bar to read more about the company. Sound fair? This way I can look at the chocolate, apart from the company; I like to start that way when I can. These two bars were yet another of my purchases from Rust General Store in San Diego--and don't worry, I'm almost done with my San Diego chocolates. I got excited about these expensive white squares because I had never heard of the company, but it looked like it might be worth: it's Fair Trade, it mentions cacao origin and percentage, there are flavor notes on the back, and there are no filler or artificial ingredients. The minimalist design of the card box suggests that the focus is on the chocolate, not frilly packaging. That said, I do not like this packaging. You see the back of the card box here? It's sealed with a red sticker, which is where the info about cacao origin, tasting notes, and ingredients is. So to open the box, you have to tear the sticker. Really? That means two things: you tear the words and can't read all of them as well anymore and you can't really close the box again. This may all seem like a minor detail, but to me it's quite annoying. The best buy date on this bar is December, so it does have a light coating of bloom. (Why do I always end up with chocolate with bloom?) As you can see, though, it's the kind that brushes right off, so the only thing it really affects is looks. And that is a shame because I like the design on this bar. It looks like a puzzle, with twenty angular pieces of different sizes and shapes all arranged inside the single square. It's like a choose-your-own collection: you can pick a piece you like or easily break one in half if you want something smaller. Visually, it has the right blend between sleekness and fun. Out of all the choices available, yes, I chose a traditional Madagascar. The fact is, I like the taste of cocoa from Madagascar and it just seems like a familiar place to begin investigation of a new company. The thing is, it's only 64% cacao; that's fairly low. The seventies are more common. As a result, this chocolate is on the sweet side for a gourmet dark chocolate. I can't help but wish there were less sugar and slightly more focus on the cocoa. Specifically, the cocoa beans in this bar are Trinitario and Criollo varieties from the Sambriano Ebene area of Madagascar. The flavor description that David Bacco gives is: "Dried figs, raisins, red fruit, and soft cacao aromas entwined with a sense of fresh figs, wild berries, and roasted hazelnut, finishes with an intent cacao flavor." Was that supposed to be "intense" instead of "intent?" Anyway. The fruity notes listed there are what compose Madagascan origin chocolate and what give it that approachable liveliness. As the chocolate melts, it does give way to a more general chocolate flavor--might I also add that this chocolate melts very smoothly. It's good chocolate and it is worth the high price I paid (which was not the most I've spent, per gram, for chocolate), but I keep wondering if it is missing something. What I keep coming back to is the sweet side to this chocolate bar. It may be that the Madagascar is simply designed to be semisweet, a bridge on the way to darker chocolate. If that is the case, maybe the second David Bacco bar will be more to my tastes. We shall see. Where land meets the sky, where bare earth is hidden between sheets of grasslands, and where color is born out of the land, that is the Painted Desert. The land spreads in the area southeast of the Grand Canyon and northeast of Phoenix; it's to the right of Flagstaff, taking the 40 out. Technically, when you visit, you will go to the Petrified Forest National Park, entering a long road from one end or the other. As you travel along this road, there are various stopping points, some with short trails and some just with lookout points. What is amazing is that, driving through the area, all you will see is grass and maybe a couple of the pretty rocks and dirt. So when you get off and look, it's like you're in a secret land. Sometimes it is colored in red, etched against all the space leading to the horizon. Sometimes it is white, decorated like ancient stone. I was entranced by the Painted Desert from the first time that I heard its name, in class in 4th grade. I didn't visit, however, until about eight years ago, and my second visit wasn't until this past weekend. It is a gorgeous place of color, completely incapable of being photographed. No picture can ever grasp what it is like to stand there. All colors seem pale in pictures and all sense of space is lost. The first time I visited, I don't remember taking the Blue Mesa Trail; it's possible that it wasn't set up yet, but I don't know. This trail takes around 45 minutes, and it is absolutely one of the best parts of the park. You descend a short distance into a land of purple and white hills. They look soft, like piles of powder, but are in fact stone, if soft stone. There are cracks in this stone, like cracks in cement: when it rains, the rain absorbs into the hills until they're full and it drains out through the bottom (or something like that). That's how you end up with the lovely, miniature dry river beds all around the hills. It was about 90 or so degrees when we arrived at the park around one. We had our picnic lunch and got off at the first few stops, and by the time we got to the Blue Mesa Trail, the clouds were settling in, the wind was gathering, and the rain was beginning far off on the horizon. Translation: the weather was perfect for a nice little walk, even if it was quite windy. It's like you're walking in another land or in an artist's sculpture, formed out of clay and painted with pastel colored pencils. You look in awe at everything. What a shade of deep purple. What beautiful tops of white. What wonderful sheltered, open space. In a way, it's better than the Grand Canyon: you have to be in good shape to for a long hike there and we're all used to seeing pictures of it, but this feels so very unique and personal. The Painted Desert is one of my favorite places. The sky seems so big and the earth so delectable. There is always something to look at, and none of it is the same. And oh, yes, here are some petrified wood stumps. The petrified wood is what the park is all about, after all, though as an Arizonan, petrified wood just isn't as interesting to me as it might be to someone else. I've always owned at least a few pieces of it (and not the boring polished kind, either). The area is also known for fossils, so some of the stores around sell fossils and the like. On the way home, I stopped to help a young dinosaur out of its shell. Cute little thing. It took me a while to admit that, in general, I don't like chili in chocolate. Unless the chocolate is very good and the effect is carried out very well, the flavors feel incongruous to me. And the harsh biting of spice tends to take away from the gentle wooing of the chocolate. So I passed by a couple of Redstone's bars in San Diego because I just wasn't interested in chili chocolates anymore. 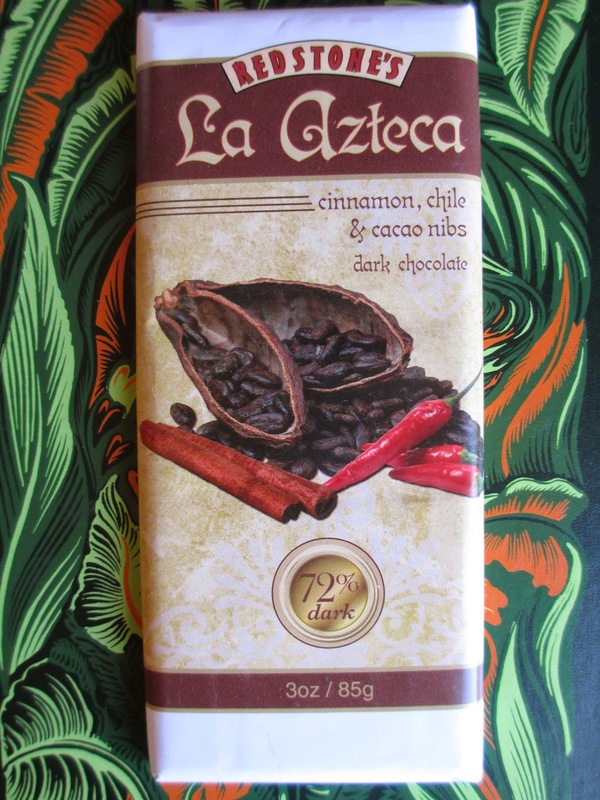 I did, however, pause on this bar, La Azteca, because it includes cinnamon and cacao nibs with the chili (which is from chipotle pepper powder). While I may pause at chili in chocolate, cinnamon in chocolate is completely natural--and also possibly a good bridge between chocolate and chili. The chocolate is in many ways completely standard. The packaging looks standard, the mold is standard, the 72% cacao content is standard, and even the light layer of bloom on the chocolate is standard. I just wasn't very excited about trying this chocolate. Yet when I unwrapped the paper and foil, there was a pleasant cinnamon scent which carries through into the flavor. This isn't the type of chili chocolate that will burn you so intensely that you can taste nothing else; in fact, the spice is rather light. A good part of it, after all, comes from the cinnamon, not just from the chipotle. Though cinnamon also has spice to it, it's generally combined with sweet things, so it helps to ease your taste buds into the chipotle as the chocolate melts. The light, squeaky crunch of the cacao nibs acts almost like a palate cleanser to keep the chocolate grounded. The nibs and the cinnamon do, I think, give this bar more of an old world feel, a sense slightly closer to rustic chocolate with many spices. I think it could all be even better and I am still not won over to chili chocolate, but if that is what you are seeking, then this little bar is not bad. I wonder what it would taste like if I made it into hot chocolate . . .